Normally when you see an album entitled "Greatest Hits," you think of a band that has had a longer career. With eXcentric, the situation is the exact opposite. This is a five piece band from New England, with the each of the band members age either 18 or 19. Greatest Hits is the band's first demo. The band was formed in 2003 when the band members were all still in high school. The guys played together at a Thanksgiving rally in 2003, and then decided to carry on as a band. So here comes the band's first demo release two years later. For such a group of inexperienced musicians, I hear a lot of talent in these six tracks. The music itself is a sort of mix between traditional heavy metal and hard rock, leaning more towards the metal side. The band's first performance was a medley of Eye of the Tiger (Survivor), Seek and Destroy (Metallica), and We're Not Gonna Take It (Twisted Sister). From that, I hear a distinct early Metallica influence in the music, albeit at a slower tempo. The riffing is similar to (but again, not as fast) what you would hear in 80's era Metallica, or 80's metal in general. All the way around, the riffing is forceful, solid, and ever present, easily the most prolific component of the sound. Also, plenty of solos and shredding can be heard, but I found these to be a somewhat basic. Still, the guys are technically sound with their instruments, much more so than I would have expected from musicians of this age. That tells me that these guys are busting their butts to improve as musicians, so you can count on improvement with each subsequent release. I could see these guys writing some pretty good thrash material in due time. The lead vocalist is certainly a very charismatic and energetic singer. However, it sounds like he is trying to hard to emulate James Hetfield quite often. Unfortunately, it's not a very good copy job. At other times, he has a sort of half spoken / half singing type of delivery. There are even a few instances where he goes for a high shriek, but it doesn't come off very well at all. In general, it sounds like he is trying to do way too much with his voice. It sounds like his voice is great for this style of music, forceful, and little raspy. Instead of trying too hard to sound like someone else or to pull off all sorts of tricks with his voice, he should just be himself and sing the songs. With time, he'll learn how to use his voice effectively to pull off tricks such as shrieking. It just seems like he's trying to do too much too fast. 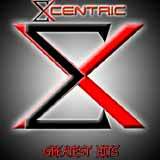 All in all, eXcentric is a band with lots of potential. Sure, they have a lot of work to do in order to reach a national or international level. Given the band's age and experience, they've developed into fine musicians pretty fast. As I said before, that indicates to me that they are dedicated and motivated by their music. As a result, I expected these guys to progress quite a lot if they keep at it. It's nice to see this generation keeping the flame of metal alive.